we thought it would be fun to include reflections on each chapter written by friends. Our friend-pairs collaborated in their writing and shared some inspiring, heart-warming, and definitely, Holy Spirit led reflections. 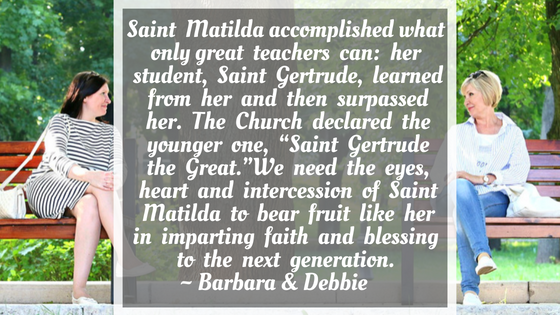 The entirely touching account of the friendship of Saints Matilda and Gertrude holds deep lessons for us all. Their relationship was a tender story of guardian and child, mother and daughter, teacher and pupil, mentor and protégé and eventually sisterhood. Although they were separated by a generation in age, they so beautifully contributed to each other’s spiritual growth. Early in our relationship, Debbie and I were more associates than friends. We were part of a missionary community and Debbie, being several years older than I, ran in a somewhat different circle than I did in those early days. Having been on my own from a very young age, I remember as a young wife and then mother making the conscious choice to model myself after Debbie in some ways. Of course, she didn’t know this! I saw something in the way she was raising her children in the faith, while being a full part of our little community that inspired me. This is a portion of the inspiring reflection by Debbie and Barbara on the virtue of faith and friendship found in The Friendship Project companion journal, available only through WINE. Purchase here: http://bit.ly/2LiJlEi ***All proceeds benefit the non-profit work of WINE ministry. Barbara Heil is a former Pentecostal minister who has traveled the world as a missionary, teacher, and evangelist. After an amazing journey, Barbara came into full communion with the Catholic Church in April of 2013. She is a dynamic and inspirational speaker with a passion to awaken others to their destiny and purpose in Christ, and to lead people in deepening their walk with God. Barbara was a widow for 7 years before marrying her husband Jeff. They reside in Iowa and together have 8 children and 10 grandchildren. Do you have a friend that helped you find, or better find, your faith? I have been blessed with so many faith-filled friends who have helped me find faith. One in particular that fits today’s reflection and saint friends, would be the DRE at my parish when I was newly married. Her name is Donna Martyniak. She became a good friend, and it wasn’t until I had the gift of hindsight did I recognize how the Lord used her to guide and build my faith. We have sadly lost touch, but the impact of her friendship will forever be etched on my heart and my very grateful soul!!! Oh the gift of hindsight. I believe those moments is what forms us. Like yourself I wish I were in distance for me to the ladies Ive mentioned. With the great communication tools we have now we are just a key stroke away. We do have the privilege however for regional to world wide meet ups with Military Conference of Catholic Women. Times too we attend retreats from the local diocese here. Oh my gosh Theresa, you really have won a spiritual lottery for sure!! How blessed!! Like a journey or road trip we encountered so many beautifies and wonders. Often we are not clearly aware at that moment that one “authentic friendship” is being formed. I believe we have faith filled friends at the different stages of our life. For instance in high school, it was a dear friend named Gerri. Although of a different faith what we had in common was the capacity to recognize this with respect. We were both military children and that world in itself can be very difficult to navigate. Gerri would often remind me of the simplicity of prayer. When you are a teen sometimes you not knowingly see the gift of friendship outside of the social type. Gerri was a constant reminder was prayer. Then going out on my own for twenty years in the military….well there was a challenge there on many levels. But my authentic friendship still exist with one young lady at the time who had so many losses in her life, in her early twenty’s and another child dying of SIDS a few months old. She continued to remain positive of life and truly courage. In short through those times of sadness she remained so in tuned around her. I can tell you today her faith remains strong and is bless with a beautiful daughter now in her twenty’s, sadly the marriage could not with stand the alread three miscarriages. Authentic friendship now as an adult is very different with our complex lives. However, I am bless to have two very authentic friends in my life. The first I have watched during the years of her generousity and service to her faith community. During a time that was very difficult for me she found the time to truly listen to me. To hear, feel and see my pain. With empathy and prayer she continues after over several years to keep my closest cares held in her heart and prayers. Her life is very busy as I noted but she does not forget to drop a line or two to me. The second lady came as a total surprise. Initially, first impressions was not favorable. It seemed she would be very closed or critical. Later I would find out this was not her at all. She, like many we know was going outside of her comfort zone and overwhelmed in a sense. Is truly find her authenticity a reminder of that old saying, “don’t judge a book by its cover”. 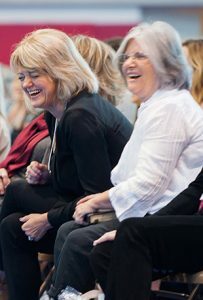 These two ladies walk in faith daily with the challenges from daily family events, unexpected change in plans, a faith community that sometimes is challenging to a myriad of just blessings of life. As sisters in faith I am so bless these ladies I can call “Authentic Catholic Ladies of Faith”. I was very moved by your reminder, not to judge a book by a cover. Wonder how many magnificent friendships I discounted because I sized the person up with my own bias or misgivings. Beautiful sharing Bernadette, thank you for your participation in this Summer’s Book Club!! I had several faith filled friends. These ladies were much older than me. They became my mentors. They were unmarried sisters who worked but also worked in the chur h, teaching catechism classes, bible school, adult education. One of these sister played the organ for mass and I began singing in the choir in fourth grade and continued until I had children. These sisters asked me to teach catechism classes when I was 17 and had just graduated from high school. I taught for 14 years until I had children. The sister who played the organ encouraged me to be a teacher. I taught for 24 years. Both of these have both gone home to Our Heavenly home. But the friendship we shared will always be a part of me. What a touching memory Deidra. Thank you for taking the time to share it with us. Remarkable the impact of a life upon another! Deidra you bring a critical point forward and that is mentors. I do believe that those individuals who have shared their faith journey did this with ease because of the love of Christ. These are true disciples spreading the word in every aspect of their lives. I’hope these sisters knew how valuable they were in sharing their gifts. My friendships in high school were just a few. I was (and still am) a very private person. The conversations were superficial about clothes, TV, movies and musicians and music. I didn’t share much of my feelings. My home life was not the best. I was quiet because I was frightened. I wasn’t a good Christian girl and I married to get out of the house. It ended in divorce and I ended up in therapy. My life has been a disaster for so many years. My family isn’t a close one and I live on the east coast and they are elsewhere across the country. I do have 3 friends that I made that have stuck with me, but they moved out of state years ago. I call them on the phone a few times a year. They have many health problems. There’s a woman at my local church that asked to be my friend, but she has mental instabilities herself turns on me verbally me for not speaking with her the “right way.” Whatever that is. I really don’t know what I’ve done to hurt her. I turn to the Lord and Mary. I have to remind myself that God has forgiven me my past and to take each day as it comes. So I pray. And if someone speaks with me, I do my best to be a good listener. I don’t mean to be a downer, but here is someone who seems to have failed in the friendship department. My therapists have been very encouraging and I do what I can to keep my emotional equilibrium. I really liked your note. Sometimes groups can give one the feeling that we are different, and therefore don’t fit in, if we like different things. I was not a Christian as a young person, and only became a believer as a very young adult. I felt like I didn’t fit in with all the “bubbly” and “perky” Christian girls. I had been alone growing up, running from abuse. I was NOT one of those “perfect” Christian girls, and later, I was still not one of those shiny, seemingly-having- it- all-together Christian women. Like you, I found out the Lord was my best friend, and then I re-read the first part of the verse, and realized I was called, not just to have friends, (which left me feeling awkward, uncomfortable, and oh, what is wrong with me?) but I was called to BE a friend. When I chose to became a friend to all, like Jesus, to give MY self away instead of waiting for someone to give me THEIR selves, it changed my life. Don’t be who you are not. Don’t join the “rah-rah” club. Be the beautiful, gentle soul God made you, and allow yourself to share your authentic heart, so that others might know YOUR friendship. I promise you, it’s truly the GREAT adventure. Linda, first, thank you for your raw honesty, it is good that we can see that others struggle as well. All relationships are work, some it is worth it, and other times we learn quickly, they are not. I believe with my whole heart, the Lord knows your desires and longs to fulfill them. The Psalms tell us, delight yourself in the Lord, and he will give you the desires of your heart. I pray that fulfillment comes sooner than later!! I pray as well that we, the community of WINE, can be a source of friendship, companionship, and encouragement!! 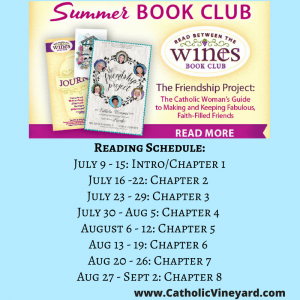 Allison I want to commend the WINE community that affords for many of us a time of reflection to growing in faith with the book groups that are formed. This is my second book club and the interaction that everyone brings is a gift in it self. WINE continues to nurture us no matter where we are in life and times of low points. I continue to look forward in the readings and being a bit more involved in the other days of the week. Graces and blessings.